We had the first real snow of the year in New York today. Perhaps there’s something magical in the air? There is! There is! We have one of those true wager-to-tie situations I wrote about a few weeks ago, when it was announced (well, not really) that tiebreakers would be used in regular play. It’s worth mentioning that this was a really good game, and it could get a heck of a lot more exciting after that timpani sounds. I’m going to start in a different spot from usual: with second and third, Mindy and Travis. Since they’re tied, they each have just two options: everything or nothing. There is no in between. Peter, our leader again tonight, has just two options himself. He can wager 11,801 to cover both Mindy and Travis, or he can stay small to stay above them if they miss or wager zero. Considering only 3 out of 149 players in pre-Final ties have ever wagered zero, that latter one is a bad bet. …and a small tear comes to Keith’s eye. One other thing I should note: from displays on the podiums after the game, it appears Mindy was given the $2,000 second-place prize. Since both she and Travis had the same score going into Final, they had to resort to the second tiebreaker. I’m unsure what that second tiebreaker is; I thought they worked backwards from the end of the Double Jeopardy! round and gave it to the player who last led. That would go to Travis. Hmm. 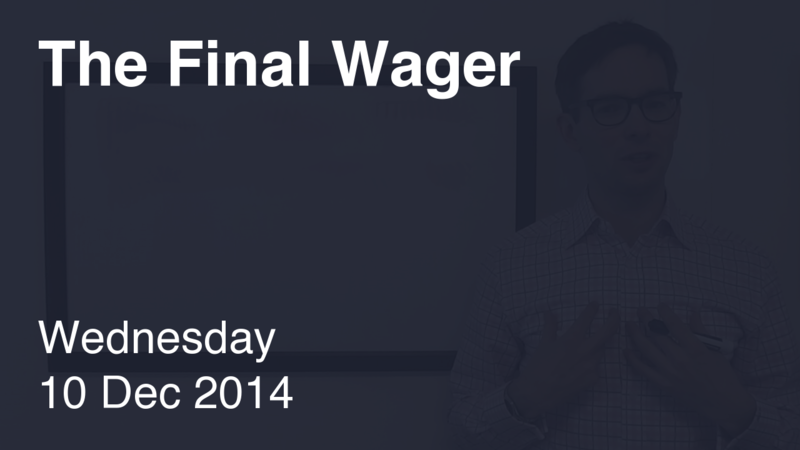 In a comment last month, Kelly the Wagering Strategist said it was the higher score after the Jeopardy! round. Mindy was in the lead then, so that makes sense. EDIT: in the hours after I posted this, several contestants past and future got in touch to confirm Kelly’s assertion. Thanks! Who was Lyndon Baines Johnson? A small correction: Harry Truman was a U.S. Senator before he became Vice President and later President. He came to the attention of the Roosevelt people by running a Senate Committee that successfully rooted out corruption in government contracting during WW II. This was in spite of the fact that it was well known that he was the protégé of Boss Pendergast, a well known racketeer. (Truman himself was a straight arrow.) I was pretty sure Truman had never served in the U.S. House. It turns out I was right. That’s great stuff, Pat – I had completely forgotten about the Truman Committee. Good thing, too, or I might have put him down! Interestingly, the zero wager option has become a lot more appealing since the new tiebreaker rules came into effect. A month ago, Travis would expect to win $27,000 and return as champion if Peter was the only one to miss Final. Now, he’d expect to win $14,000 and just half of the equity of returning for another game. In fact, if Travis assumed that Peter and Mindy would wager 11,801 and 13,500, a zero wager becomes incredibly appealing. I’ll follow up with some stats in a minute. With a wager of 13,500, Travis wins 98 times out of 434. He will finish second 176/434. With a wager of 0, Travis wins 151 times out of 434. He will finish second 164/434. Of course, with the bigger wager, there is also a bigger payout. For each extra time Travis gets to return as champion by wagering small, he will earn about $11,480 less in the current game. Thanks for those stats, Aaron. I am still wondering if the multiple lowball first-place wagers last week (Monday and Friday) were outliers, or signs of changing winds. I’m guessing the reason we’ve seen so few zero wagers in the tie scenario is most players want to take control of their own destinies. It seems that three green wagers is almost as rare as a tie going into FJ. When was the last time that happened? But if I understand the new rules correctly, if Peter had missed and Travis and Mindy had tied at $27,000, it would have gone to a sudden-death question format where the first to get it right would win the full prize amount. That being said, if a hypothetical player A had $20,000 going into FJ, and player B had $10,000 (with player C irrelevant), as player A I would risk $0 instead of $1, knowing that I would at worst end up with a chance to play heads-up for the money, and possibly win outright if player B missed. You are correct – there would have been a sudden-death tiebreaker. As Player A in a lock-tie situation, unless you’re totally uncomfortable with the category, I would always wager something. There is a positive correlation between correct responses, so if Player B gets the clue correct, there’s a better-than-50% chance you will, as well.